The Mom Standard: Better than coffee! Today I have had a pickle up my rear, chip on my shoulder, and piss-poor patience. What could snap me out of this icky attitude? 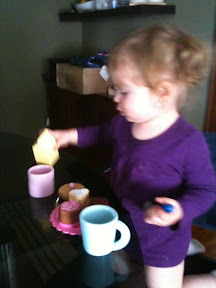 Sitting at the table having coffee and cakes with my daughter. Sometimes Mommy G_d needs to be told to sit down and just enjoy the moment.